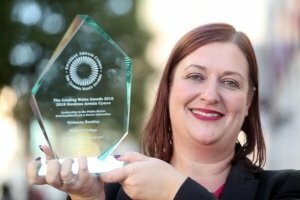 Bridgend College’s people centred and inspirational Deputy Principal Viv Buckley was recently crowned the winner of the ‘Leadership in Public Sector Award’ at the Leaders in Wales Awards 2018. The Awards, in their 14th year this year, were established by a consortium of professional institutes, private companies and voluntary and public sector bodies. There are 8 categories that make up the Leading Wales Awards, 7 of which recognise personal achievement in leadership. Viv recently spent some time in South Africa representing Bridgend College as part of a collaborative project with British Council Wales and Lovedale College, South Africa, where they spent their time visiting and inspiring local schools and colleges in the area. In April, Bridgend College was voted the Best FE College in the WhatUni Student Choice Awards, as well as being proud winners of the RSM Award for Leadership and Governance from the Association of Colleges’ Beacon Award in 2017. Viv herself was also shortlisted for the ‘Chwarae Teg Womenspire Awards’ Woman in Education Award in 2017. Also, on Friday, 28th September at a glamorous awards ceremony held at the Marriott Hotel in Cardiff, Bridgend College were announced as winners of the ‘Care Employer Award’ at the Wales Learning Disabilities & Autism Awards 2018. The judges were impressed by the all-inclusive approach demonstrated and commended the College as being a real people centred organisation. They also complimented the strong culture and the provision of the necessary services to the highest level. Hosted by Care Talk Magazine, the awards are now in their fourth year but this is the first year they have expanded to include a bespoke event in Wales. The Learning Disabilities & Autism Awards offer a unique opportunity to celebrate the successes of individuals, teams and businesses in the sector – people and organisations who really do make a positive impact on people’s lives. They aim to pay tribute to people who specifically support those with learning disabilities and autism and also recognise inspirational individuals with a learning disability and/or autism who make a real difference within their communities. Bridgend College are extremely proud of Viv and all staff who have made these wins possible.